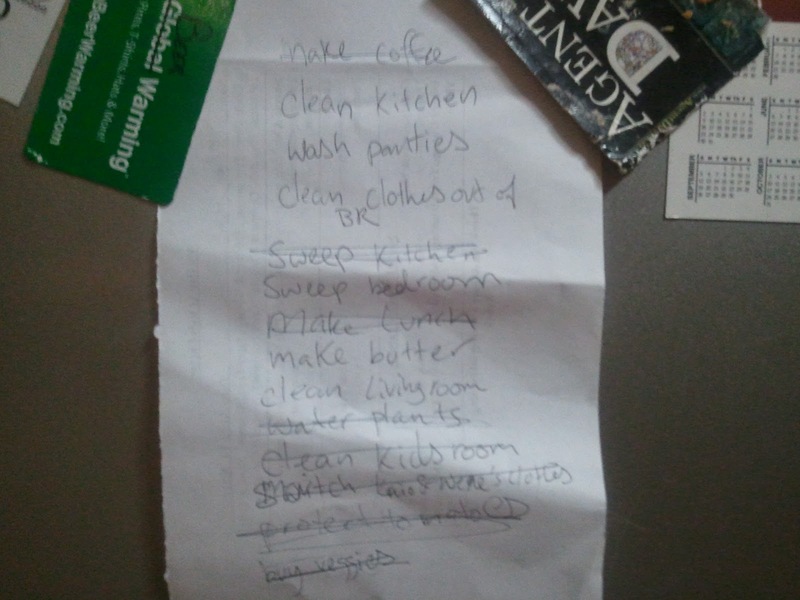 I got over half of the to-do list complete, which is amazing considering the rough morning. First thing on the list: make coffee. By 11am, that was still the only task checked off. The morning was disrupted by Nene painting the wall with her poo. Heavens knows what could have come over her to make her think that was a good idea, but I made both her and Kaio sit in timeout while I cleaned it up (Kaio was already on route to time out for repeatedly climbing on the fireplace). I told her no more drawing for a week. On Friday night she had taken a marker and drew on my friend's wall. It wouldn't come off and they are gong to have to paint over it. So, I can't believe I'm restricting her use of art supplies! But she needs to stop expressing herself at will. No picture of the poopoo painting, don't worry. Instead a picture of her being cute in a second hand dress I got for $4. When I told Mari, he shrugged and said that he used to play with his poop all the time too. So after the poo painting incident, I put my foot down and switched to a very mean mommy. I made them 'clean' their room. Basically meaning that I would hold things up and ask them where it goes, then give it to one of them to put away. No one was allowed to leave till the room was spotless. I also folded all the clothes in the closet, and moved Kaio's to the lower shelf where he can reach them. Since he dresses himself now, he needs to be able to reach the clothes. On days that I've forgotten to leave clothes out for him on the floor, he'll come into our room in the morning wearing a pair of Nene's pants. We spent all day at home cleaning things instead of going to a museum 'to look at princess dresses,' (sigh) like we had discussed. I was peeved and stayed pretty firm all day, but things worked out. After a day of cleaning, the kitchen still remained only half done. I really miss our maid! She moved to Bolivia a few months ago. I sent her a message on facebook begging her to come back. Kaio's been a punk about eating lately. He does not want to eat anything. Everything is "yuck." Today I decided to not invite him to lunch. Like a coy cat, he eventually came on his own, sat down, and gobbled the food up like it was going out of style. We did not have a fight over lunch today. It helped that I made delicious coconut rice with sirloin. Same deal with nap time. I said that it was time to take a rest. Kaio said "No!" I took Nene up and mr. independent eventually followed.